Camera traps have revolutionised the way we observe and study wildlife. From citizen science census projects to investigations into behavioural ecology, camera traps allow us to observe wildlife in a way not previously possible. 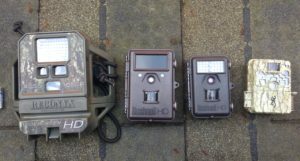 Camera traps belong to a class of wildlife monitoring techniques referred to as ‘non-invasive’. They allow for data collection without humans being present and therefore are often considered as less stressful to individuals. Camera traps are versatile and can be used to study a wide variety of species in habitats ranging from Arctic tundra to tropical rainforests. 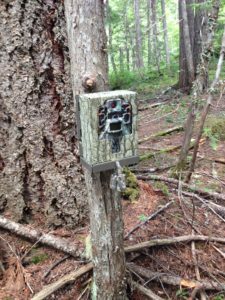 First developed primarily as game scouting cameras, camera traps are now used equally as often for wildlife research purposes. This has helped to drive development and camera traps have improved dramatically in design, function, and cost since 2005. We are using camera traps to obtain a dataset of both training and test images of individual bears, in order to develop our face recognition system. Over the years we have used Reconyx, Bushnell, and Trailmaster camera traps, but are now concentrated on using Browning (1080P models). We are experimenting with camera placement and positioning in order to capture facial images of bears, which will help to develop our field methodology for use of the bearid system.